It wasn’t just cool cars that were unveiled at the Frankfurt Motor Show the other day – Italian jewelry house Bulgari rolled out two cool new versions of its iconic Octo created in collaboration with Italian auto brand Maserati. The new Octo Maserati GranSport and GranLusso pay homage to the legendary luxury of Maserati’s high-performance cars, building on a partnership forged between the two brands in 2012 when the Octo was first launched. 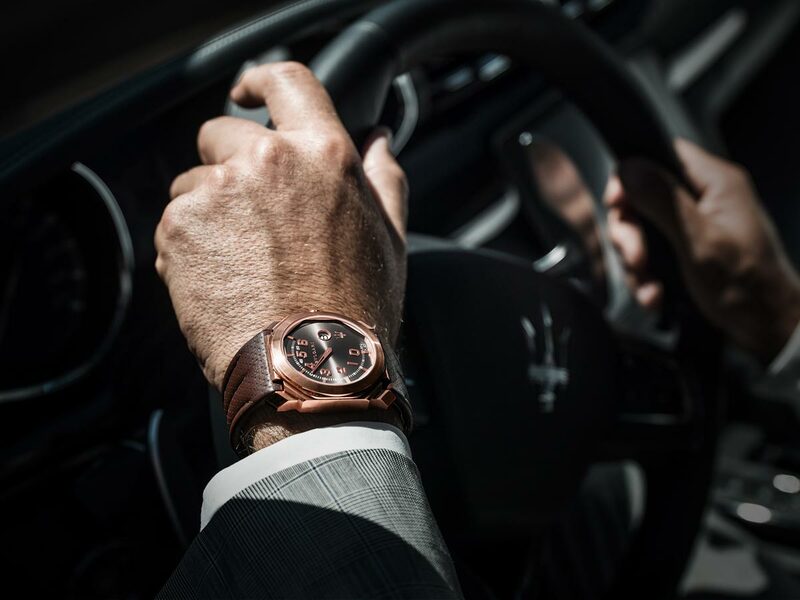 Designed for both Maserati drivers and haute horlogerie aficionados, the watches feature cases in either DLC (Diamond Like Carbon) treated stainless steel or 18kt rose gold with 41.5mm cases. Just as Maserati engines are crafted by hand at the brand’s factory in Modena, Italy, the mechanical Retro BVL 262 calibre that powers the new Octo models was developed and manufactured in-house by Bulgari. While there may be the Breitling for Bentley partnership, the Bulgari and Maserati is a powerful combination as well. The 33-jewel automatic movement features Côtes de Genève, chamfering and beveling techniques along with a 42-hour power reserve, oscillating at 28,800 vibrations per hour. The Retro BVL 262 powers jumping hours and retrograde minutes displays elevating it above the usual run of automotive-inspired timepieces. The DLC version is the GranSport with a black dial and silver-toned numerals, hour-markers, and counters with blue highlights. The gold model is, of course, the GranLusso with a black dial and hands with indexes in rose gold to match the case. The two new models, both on sporty perforated leather straps, come on the heels of the ultra-exclusive Octo GranTurismo edition which made its debut at the Goodwood Festival of Speed in July. 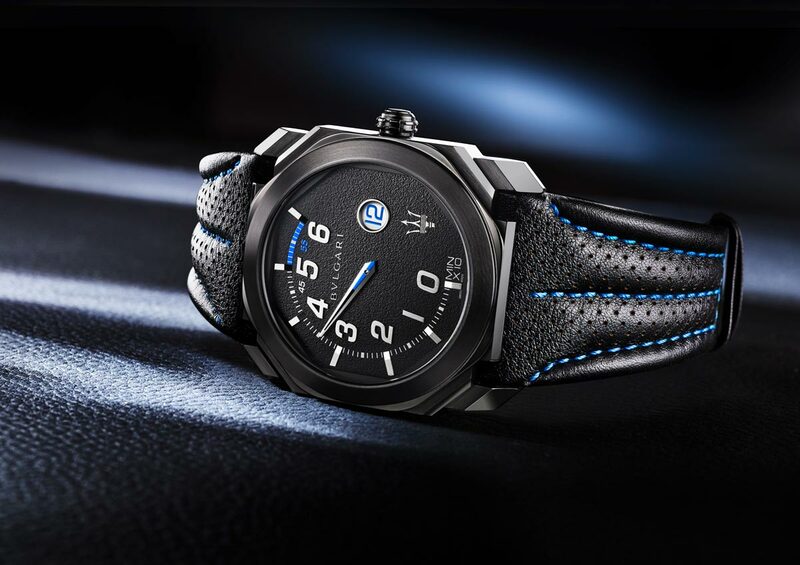 Just 30 examples of the DLC coated timepiece were made available to customers who ordered a new Maserati GranTurismo and GranCabrio. The new Maserati GranTurismo, also unveiled at Frankfurt, powered by a Ferrari-Maserati V-8 good for 460 hp at 7000 rpm and 384 lb-ft of torque at 4750 rpm. That’s said to be good for a 0-62 mph clock of 4.8 seconds and a top speed of 186 mph. Obviously, a car this powerful and beautiful requires a watch that can hold its own at high speeds and impart some of the same debonair Italian style. 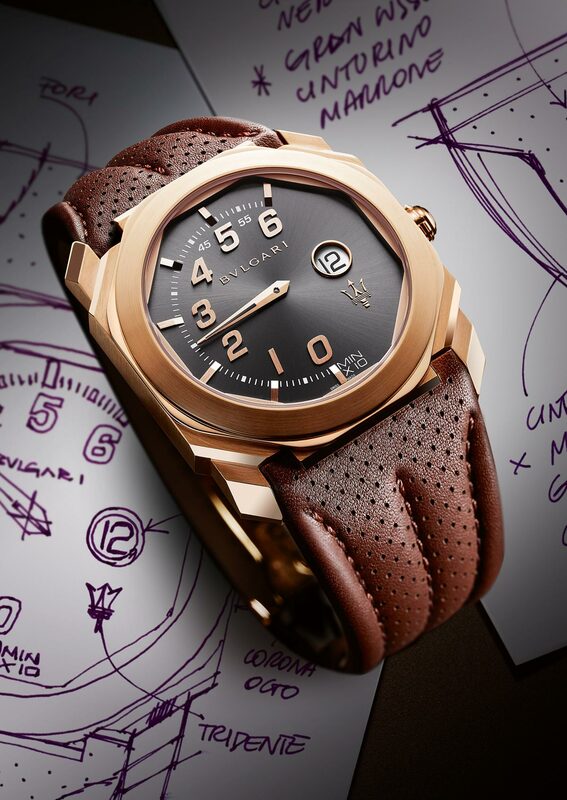 While Bulgari may not be the first choice of some watch aficionados, the Octo undoubtedly has plenty of appeal, and we think it’s a good match for Maserati, which is known for collaborating with other Italian luxury goods houses like Ermenegildo Zegna. How about a round of applause for Bulgari and Maserati collection.